What an exciting last few days! The babies are all doing great. Yesterday, Busha fed all 4 babies back-to-back...-to-back-to-back. I don't know how she did it but it must be some great-grandma magic! We have re-named our 1/2 of the pod "The Brady Bunch" because all of our little ones have bouts of bradycardia (aka brady) where their heart rates fall below 86. 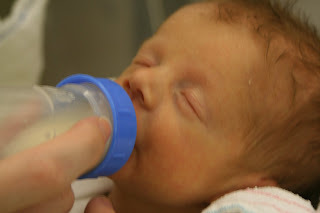 Noah is now taking a bottle twice a day while still getting continuous feeds. It is sometimes hard to feed him because he sleeps most of the time. That is ok becasue his little body needs the rest to heal. Also, his intestines are working well - we'll spare you the details. He, too, has started having bradys lately just like the others, and bounces back quickly. They say this is normal even for adults but we are a little stronger than the babies are. Noah tips the scales at 4 lbs 10 oz! Sophia is as cute as ever and still the eating champ. 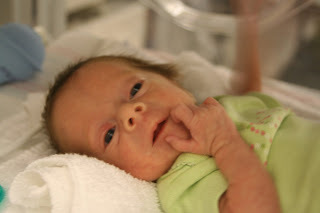 She is not with her brothers yet in the mega-crib because her body temp dropped a bit so she is back in her isolette. She has been so wide awake lately and definitely lets us know when she is hungry. I think she gets so excited to eat that she bradys when she first starts to eat. She is now 4 lbs 2 oz! Finn is doing better with his oxygen levels now, but is still on oxygen through his nasal cannula. Him and Cohen get to hang out all day together in the crib. He has had a few bradys lately and passes them to Cohen. Finn weighed in last night at 4 lbs 11 oz! Cohen broke his string of "no bradys" the other day. Finn had one and seconds later Cohen had one while sleeping. This counts toward the "7-day" rule so he gets to hang with others for a little longer. Cohen broke the scale at 5 lbs 7 oz!!! 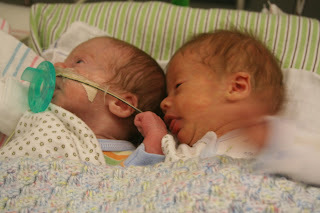 It is amazing how sometimes Finn and Cohen's heart rates will be exactly the same and they'll wake at the same time. Yesterday, Mari nursed Cohen and Finn - at the same time!. It was like a race to the finish. Finn would open an eye and check out Cohen and then they would both start feeding furiously, stop at the same time, and then go at it again. 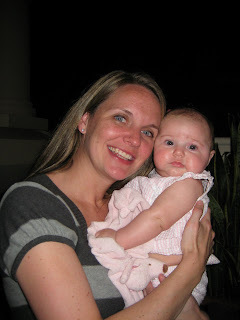 Our friend, Jenn, from Austin, came to visit this weekend with her baby, Ansley. Ansley is 4 months old now. Holding her was nuts compared to our babies. I realized just how small our little guys are right now, but they are catching up quickly. How our lives have changed! 3 years ago we flew to San Francisco with Jenn for a fun-filled weekend of wine, staying up all night and all kinds of craziness! We are all parents now, and have whine at all hours of the night, and lots more craziness! Grammie Goerlich, mema, and pepa stopped by the house on their way back from Madeleine's 1st b-day party. They said it was hit with cake on the face and all! Grammie brought a ton of gifts from her friends. We thought we were organized but now have to do more:). It is still weird that we have 4 babies and our lives haven't changed that much.....yet! We went out for a nice dinner last night after hangin with the babies all afternoon. It is so cool to have Mari back in action from bedrest and to be a team again. Hello Goerlich Bunch - Its good to see the babies again. I have been busy and haven't been able to get online. You guys are still in my prayers. I need to come up there and see the babies! Love you guys!! How wonderful they are, thank you for sharing! I stand in awe of these four, little amazing lives. "The Lord is good, a refuge in times of trouble. He cares for those who trust in Him." Nahum 1:7 Holding you all in prayer and praise. P.S. Next San Fran Trip will be in a bus!! Watch out Cali, here we come! I got your blog address from Suzie Steece. I live in the Dallas area and am 13 weeks pregnant with quads. I love looking at your blog and the other quad moms. It helps keep my spirits up that everything will be good :) Your babies are beautiful!